SUMMARY: If a prospective customer searches for a term in a search engine, and then clicks through an organic result to your website, they are extremely likely to convert, right? After all, they're highly motivated … they just searched for that term! To get an answer to that question, we asked marketers from different industries for their conversion rates from organic traffic. Read on to see what they had to say. Q: What is your organization's conversion rate for organic traffic? Q: Which single category best describes the type of organization you work for? At MarketingSherpa, our goal is not only to provide marketing data that can help you do your job better, but help you understand the data, as well. We'll discuss considerations for organic traffic conversion in just a moment, but first, a caveat to help you interpret the above data. Take it with a grain of salt. It can give you a general idea of organic conversion rates, but we are in no way suggesting that any of these numbers are the exact, perfectly correct benchmark for your company. This may be why, for example, marketing agencies, consultancies, media and publishing companies report the highest conversion rates (20%), with retail, e-commerce, sales or wholesale distribution reporting the lowest conversion rate (11%). 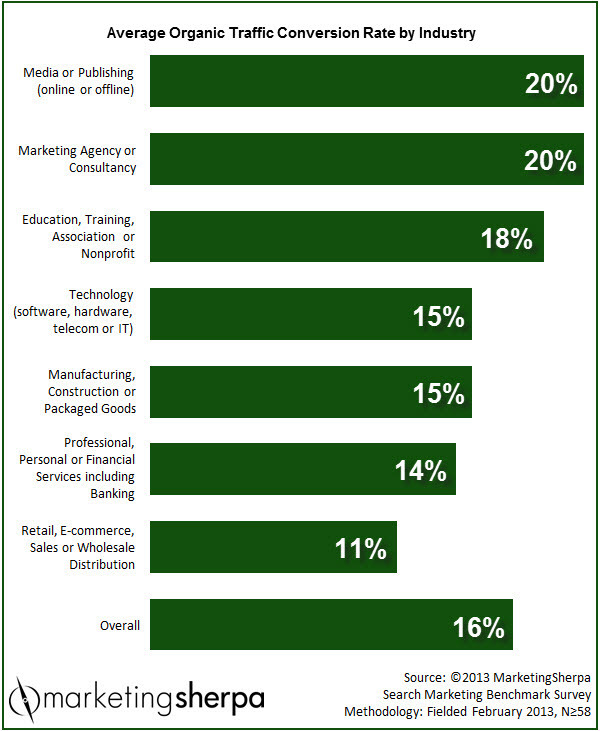 At the high end of conversion rates, marketers in these industries are likely only looking for a lead form fill. In the case of media and publishing, often the conversion may simply be reading a free article — much like you're doing now for MarketingSherpa … thanks for converting. On the low end of conversion rates, these companies are likely looking for an actual online sale, which, all things being equal, will be harder to achieve than a simple lead form fill. With that out of the way, let's look at four factors to keep in mind for organic traffic conversion. Here is something interesting we can learn from the chart — overall organic conversion rates were much higher than the low single digits that are typical for direct mail, TV or radio. So, if your organic traffic is underperforming conversion rates of other channels, it is worth exploring why that is. Do your targeted keywords not reflect your product, service or conversion goal? Is your meta description misleading? Do you have a technical error on your page? Perhaps prospects open several tabs in their browser and comparison shop. Take a look at the SERP (search engine results page) results closest to yours, and see what those companies may be offering that you are not. On the flip side, even though organic search traffic converts well, it is not so highly motivated that you can expect a 0% bounce rate. After all, a 20% conversion rate is great, but it still means 80% of traffic is not converting, so take heart when you see a non-zero bounce rate in your analytics. Broader, more general keywords (for example, "seeds") tend to be used by prospective customers early in the buying process in the discovery and research phase, while longer, more complex keywords (for example, "organic purple carrot seeds"), also known as long-tail keywords, tend to occur later in the buying process, closer to final purchase. These long-tail search keywords may even include specific product names or model numbers. Matching your conversion goal to the types of keywords used and the stage in the buying cycle can help conversion rates. For example, at the "seed" (general keyword) level, a simple email capture form to sign up for an email newsletter about gardening may be the most effective conversion goal. However, at the "organic purple carrot seeds" (long-tail) level, an online sale may be the most effective conversion goal. "We employ multiple phases of SEO. Once we establish an SEO plan, we verify the conversion rate of our keywords and direct response messages via PPC. It's only after we have good conversion metrics that we activate our inbound marketing strategies." Landing page testing can help you discover the best ways to achieve your conversion objectives. In a nutshell, conversion optimization (also referred to as conversion rate optimization — CRO — or landing page optimization — LPO) is the discipline of making intentional changes to your website and landing pages to improve conversion, conducting A/B split tests to see which changes work best, learning from those tests, and then continually making changes (and testing) in a virtuous cycle of conversion rate improvement. So, what if your organic search traffic conversion rates are vastly lower than conversion rates from other channels? Or even vastly lower than the benchmarks above? "Tracking is still a big issue when it comes to mobile search, especially from a multichannel standpoint. Also, traditional optimization process does not work as effectively as desktops. You need to have a mobile first strategy with a fully optimized mobile website and campaigns in order to make a real difference which requires a considerable investment. Lastly, conversion is still a big issue when it comes to mobiles with the exception of tablets, of course."